Love nature, and I most definitely love less stress, relaxing and doing something I love and I love to craft. DAC Has all of the above, with Diamond Art Club I truly can relax and craft😊 with ready to go projects right out of box if you want. Recommended highly and the customer service is awesome. You won't be sorry, give them a try if you haven't. 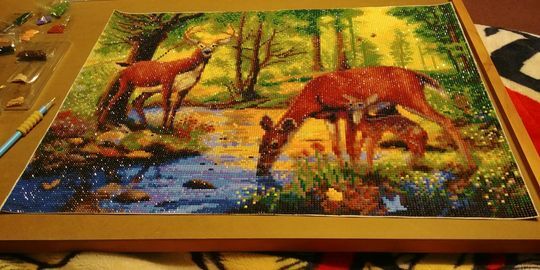 Rhonda W. Reviewed by Rhonda W.
Just finished this one today! Can’t believe how pretty this turned out! The quality from DAC is second to none! I have ordered a couple from other companies to see how they compare, there is no comparison! DAC is hands down the best bang for your buck as well as great quality. You get what you pay for! Started my next large painting and already it looks wonderful, all the while waiting for yet another order to arrive. DAC gets my vote! I love the dear design. I love the quick delivery and designs that you offer.